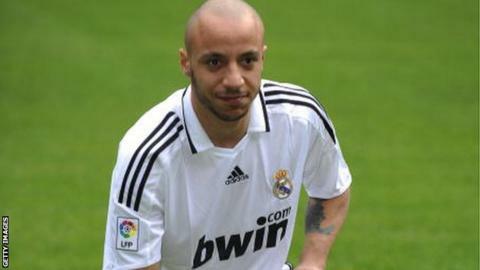 St Johnstone have handed a trial to former Real Madrid and West Ham United right-back Julien Faubert. The 32-year-old capped for both France and Martinique is a free agent after leaving Bordeaux last summer. Saints boss Tommy Wright has also taken defenders Daniel Adejo and Plamen Krachunov on trial. Wright said: "All three come with very good pedigrees and quality, but what we'll have to look at is fitness as well as ability." Adejo joined Kalloni in 2014 from Reggina but left in January, the 26-year-old Nigerian having made 11 appearances for the Greek Superleague club this season. Krachunov played eight times for Slavia Sofia this season in his homeland's top flight, the 27-year-old having joined from city rivals CSKA in the summer. The central defender has played all his football in Bulgaria, his previous spells being with Maritsa Plovdiv and Lokomotiv Plovdiv. Faubert, who began his career with Cannes, had spent three years back with Bordeaux in the French Ligue 1 before his release. It was his second spell with Les Girondins, who he left to join West Ham in 2007. During his five years with the English club, he had a short loan spell with Real Madrid before leaving to join Turkish outfit Elazigspor. Faubert, born in Le Havre but of Martinican descent, made only one appearance for France, scoring on his debut in August 2006 against Bosnia and Herzegovina. He used a legal loophole - the Martinican Football Association is not a member of world governing body Fifa - to make a second international debut. Fuabert scored against Curacao and went on to score twice in his next two international games.